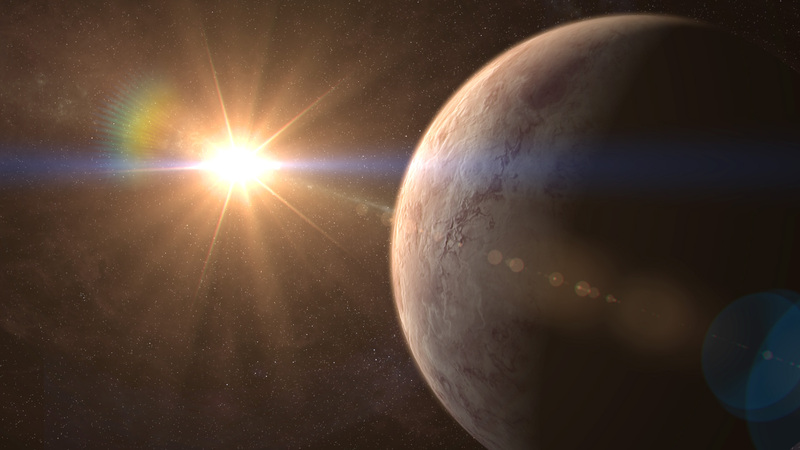 Headlines > News > Scientists from the IAC and the ULL discover a nearby "superearth"
Scientists from the IAC and the ULL discover a nearby "superearth"
Its short orbital period could help with future studies of biological activity. The PhD student Alejandro Suárez Mascareño, of the Instituto de Astrofísica de Canarias (IAC) and the University of La Laguna (ULL), and his thesis directors at the IAC Rafael Rebolo and Jonay Isaí González Hernández have discovered a “superearth” type planet, GJ 536 b, whose mass is around 5.4 Earth masses, in orbit around a nearby very bright star. The study has been accepted for publication in the specialized journal Astronomy & Astrophysics; researchers from several countries are involved. “So far the only planet we have found is GJ 536 b but we are continuing to monitor the star to see if we can find other companions”, says Alejandro Suárez Mascareño, who is the first author on the article. “Rocky planets are usually found in groups”, he explains, “especially round stars of this type, and we are pretty sure that we can find other low mass planets (other “superearths”) on orbits further from the star, with periods from 100 days up to a few years. We are preparing as programme of monitoring for transits of this new exoplanet to determine its radius and mean density”.